As is customary for me, I get involved in cooking these big complex dinners and then don't take adequate photographs of my hard work! 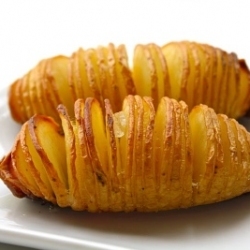 Below are hasselback potatoes, or so I have learned from a nice cooking blog called Sea Salt with Food. Hilariously, you can see the photos below are the very nice photography result, and the "real" thing with bad fluorescent lighting in my boss' house (where I cooked a dinner for 15 bankers). Anyway, this recipe is a fancy way to dress up any day potatoes for a dinner party. The final result (despite the bad lighting) did turn out more like the first picture - I promise! Technique is everything with these potatoes. First, scrub them and make them look pretty. Second, slice thinly all the way down until the very end of the potato, being careful to not slice all the way through! Do it slowly, with a sharp knife, and make sure the slices are very very thin. Grease a baking sheet and heat oven to 350. Place potatoes in the oven, drizzle with olive oil, top with butter (as pictured), and cook for 45 min - 1 hour. To serve, sprinkle with sea salt and ground pepper. Make sure to make an extra one you can split apart and taste before serving - you want it to be cooked all the way. If the potatoes are browning too fast, just put foil over them and put back in the oven at 325.